Luke Storer would also move up a spot in the late race shuffle as he moved from third to second while defending Champion Joel Chadwick, who had led the opening 25 laps, would fall back to third. 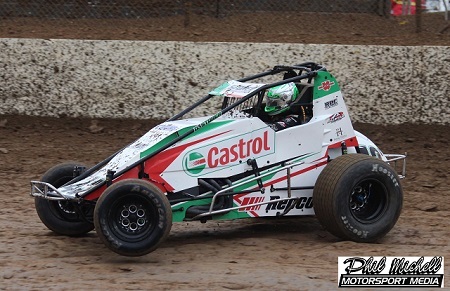 Western Australian Tom Payet looked set for a podium position after running second to Chadwick, but he too would lose out as he fell back to fifth in what was an outstanding finish to what had been a great weekend of Wingless Sprint racing. One of the major factors in the frenetic run to the flag was the fact a light shower fell over the race track during the red-light caution for Matthew Kennedy’s wild crash on lap 25 changing the track conditions. With Chadwick being the leader, he was perhaps a little too cautions as he protected the inside groove on the restart while Daniel Storer took the gamble and went straight to the top of the track in the heavier dirt. Luke Weel finished behind the podium trio as he pipped Payet during the race to the flag, while Jason Bates, Jarman Dalitz, who transferred from the B-Main, Jake Ashworth, Brett Ireland and Joel Heinrich completed the top 10. Victorian Chris Halesworth, Mark Taylor, Kerby Hillier, Michael Spoljaric, Geoff Cook and Carly Walsh were the only other finishers. Matthew Kennedy was running sixth at the time of his accident on lap 5 while Australian Champion Alex Ross was another high-profile driver not to complete the journey. Earlier Geoff Cook, Joel Chadwick, Alex Ross and Luke Weel were the winners during the final round of heats while Renee Pestka and Jack McCarthy transferred out of the C-Main. The C-Main would see Jay Brown crash out after clipping the spinning car of Anthony McMillan in turn four. Alex Ross, Jarman Dalitz, Carly Walsh and Anthony Tapley would be the top four across the line in the B-main but Tapley would be disqualified for being underweight post-race elevating Michael Spoljaric into the Championship final. The night also was the running of the Annual Ross Wright Memorial for the 360ci Sprintcars, which also doubled as round 11 of the Mainline Dynolog Dynamometers Australian Allstars Series with defending race Champion Ryan Jones winning the race for the third time. Jones hadn’t raced a 360ci Sprintcar at Murray Bridge since November 2016 but after a refresh of his trusty PM Engines powerplant it didn’t miss a beat as he dominated the final once he got past early race leader and pole sitter Mark Caruso. Third across the line was South Australian Champion Dan Evans with Victorians Michael Tancredi and Brenten Farrer completing the top 5. Jones’ victory ended a run of recent victories for Victorian drivers at Murray Bridge during Allstar competition with Phil Lock, Farrer and Tancredi having won the past three rounds at Murray Bridge. Terry Pitt was next across the line while Brendan Guerin fought his way to seventh after spinning to avoid a slowing Steven Caruso while fourth. Cody Atkins, James Wren and Michael Lovegrove completed the top 10 in the 20-car field. Series leader Mark Caruso started his night in the best possible was as he set the fastest lap in Qualifying before going on to win heat 1. Ryan Jones was an easy winner of heat 2 while Ben Morris and James Arayosi won the final two heats. Mark Caruso was declared the winner of the pole shuffle after Ryan Jones was deemed to have jumped the start in the race for the pole position.